The Aleutians East Borough includes the communities of Akutan, Cold Bay, False Pass, King Cove, Nelson Lagoon, and Sand Point. Commercial fishing and seafood processing are the driving force of the region’s economy. Salmon, crab, pollock, halibut, rockfish, and other species are harvested by both local and non-resident fishermen and processed in local facilities. In 2001, seafood-processing jobs accounted for 90 percent of the borough’s private sector wage and salary employment. Akutan is a second-class city located on Akutan Island in the eastern Aleutians. Akutan Island is one of the Krenitzin Islands of the Fox Island group. The island’s hills are home to a diverse array of wildflowers and berries. Akutan sits just west of an active volcano and not far from the island’s thermal hot springs. Belkofski is an unincorporated village in the Aleutians East Borough, located at the eastern end of the Alaska Peninsula, 12 miles southeast of King Cove. Cold Bay is a second class city in the Aleutians East Borough, located in the Izembek National Wildlife Refuge at the western end of the Alaska Peninsula. It is the major air transportation hub of the region, connecting the surrounding villages and most of the borough with Anchorage. Cold Bay’s primary services include the fishing industry, Aleutian transportation, and wildlife protection. Subsistence and recreational fishing and hunting are a part of the local culture. False Pass is a second class city in the Aleutians East Borough. 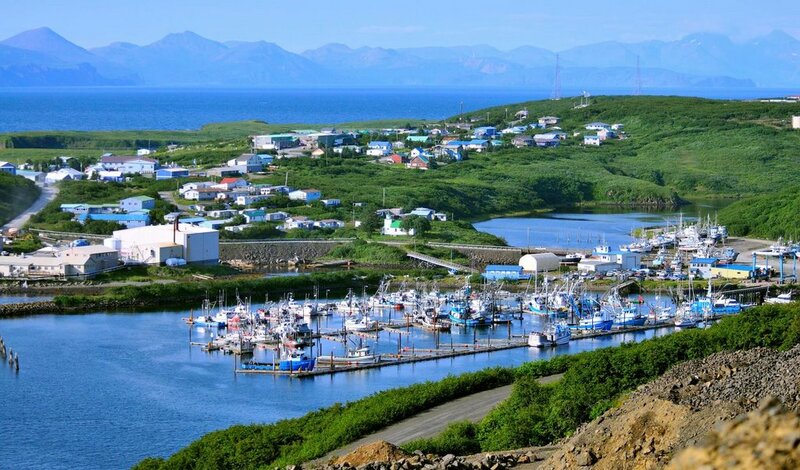 It is located on the eastern shore of Unimak Island, on a strait connecting the Pacific Gulf of Alaska to the Bering Sea. The landscapes of False Pass has developed primarily on a base of volcanic material which has been subsequently eroded by ice and water. Since volcanism is an active on-going process, the landscapes on Unimak Island are rugged and from the point of view of Geomorphology, are quite young. Most of this landscape is untouched by human activity and lies within the National Wildlife Refuge system. The community is primarily Unangan. Fishing, fish processing, and subsistence activities are mainstays of the culture. King Cove is a first class city in the Aleutians East Borough, located on the south side of the Alaska Peninsula, on a sand spit fronting Deer Passage and Deer Island. The city is situated in a narrow valley overshadowed by rugged mountains reaching down to the water’s edge. Nelson Lagoon is an unincorporated village in the Aleutians East Borough. It is located on the northern coast of the Alaska Peninsula, on a narrow sand spit that separates the lagoon from the Bering Sea. Pauloff Harbor is an unincorporated area in the Aleutians East Borough, located on the northern coast of Sanak Island, 50 miles southeast of False Pass. The community name differs from the harbor on which it is located – Pavlov Harbor. A post office was established in 1949. The island is now unoccupied. Most of the shareholders now live in Sand Point. Float planes or personal boats from False Pass or King Cove are the primary means of transportation. Sand Point is a first class city in the Aleutians East Borough, located on Humboldt Harbor on Popof Island. Sand Point is also known as Qagun Tayagungin. Unga is an unincorporated area in the Aleutians East Borough, located on the southeast coast of Unga Island, in the Shumagin Islands of the Aleutian Chain. Float planes or boats are the only means of transportation to Unga.